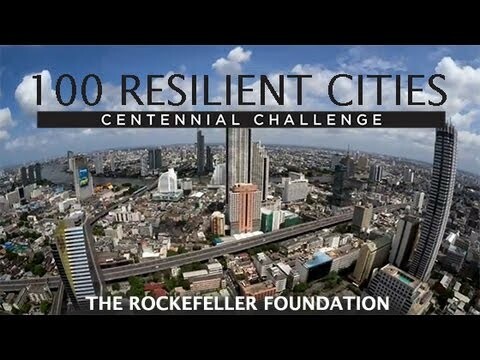 100 Resilient Cities, a project of the Rockefeller Foundation (100RC) is dedicated to helping cities around the world become more resilient to the physical, social and economic challenges that are a growing part of the 21st century. 100RC supports the adoption and incorporation of a view of resilience that includes not just the shocks – earthquakes, fires, floods, etc. – but also the stresses that weaken the fabric of a city on a day to day or cyclical basis. Examples of these stresses include high unemployment; an overtaxed or inefficient public transportation system; endemic violence; or chronic food and water shortages. By addressing both the shocks and the stresses, a city becomes more able to respond to adverse events, and is overall better able to deliver basic functions in both good times and bad, to all populations. d-Membership of a global network of member cities who can learn from and help each other. The common problem areas listed in the project’s website, are flooding, infrastructure inadequacies and pollution. Idividually speaking,Bangalore has to deal with poor transport system,Chennai has to contend with overpopulation and a constant threat of cyclones and finally Surat has challenges of disease-outbreak and rising sea levels. .
Water will remain among the key challenges for Bengaluru, as it now depends on pumped water from the Cauvery nearly 100 km away.